As a New England Yankee (50% Connecticut Yankee and 25% “Downeasterner” [Maine]), whose roots were firmly planted in earliest English colonial days, I inherited 300+ years of “Yankee pride.” Until two years ago when I first enrolled as an auditor in Prof. Craig Nessan’s seminar titled “American Genocide 1 – Native American,” I hadn’t given much thought to the people who inhabited these lands for many, many moons before my progenitors sailed across the ocean in the early 1600’s, and invaded, seized, and settled on land stolen from Native nations who already lived here. Our course readings pointed out the horrendous slaughter of thousands, perhaps even millions, of natives by the uninvited Europeans. They stole the land and its resources from those who had lived here for thousands of years before white people appeared on the shores of the North American continent. Quickly, my Yankee pride turned into a deep sense of guilt and shame. Prof. Nessan suggested that we don’t have collective guilt for sins committed by our predecessors before we were born, but we can experience collective shame for the actions of our forebears and our nation. Just as we cannot individually go back in time to undo the sins we’ve committed so also as a people collectively, we cannot undo what our nation or our personal forebears did throughout five centuries of genocide. But we can take note of current situations, and of the residual suffering of people today. I see a way of currently doing that by educating ourselves and by becoming aware and supportive of Native Americans who are trying to preserve what land and resources they still have. We can refuse now to permit an oil pipeline to be buried across their existing reservations, desecrating traditional sacred places, and with the potential for polluting natural resources: clean drinking water, produce from the soil, or shade and fruit from whatever trees may be left. My Yankee pride has turned into a deep sense of “collective shame,” but also of personal shame. I am ashamed not simply of what generic white European colonists have done to North American Natives, and to captured and enslaved Africans, but for what was done by my own identifiable direct ancestors (including clergy). Recently, I have been reading the stories of dozens of my own known ancestors in context of their negotiations for land or their relationships with the Native Nations. Clearly many of my direct ancestors fought them in the Pequot War of 1636-1638 and in King Philip’s War (1675-1678). They bartered with the Natives for land. They depended upon the Natives for provisions to get them through a very severe winter. And at least one of my forebears apparently kept an Indian maiden as a slave, as his will provided that she should have her freedom when she reached the age of 26. I have also learned that l have at least a few slave-holders of Africans among my ancestors. Lord, I as a Yankee pray for forgiveness for racial arrogance. I pray for remembrance and honor for the lives of the millions of Natives who were senselessly erased by my racially “privileged” white ancestors. January term is a time of exploration and learning outside the classroom. The “Encuentro”, or encounter, is offered through Lutheran Seminary Program of the Southwest, in Austin, TX. Five Wartburg students went to Texas to encounter the borderlands and the people who live there. This class was centered around the political, social, pastoral, and missional aspects of immigration. 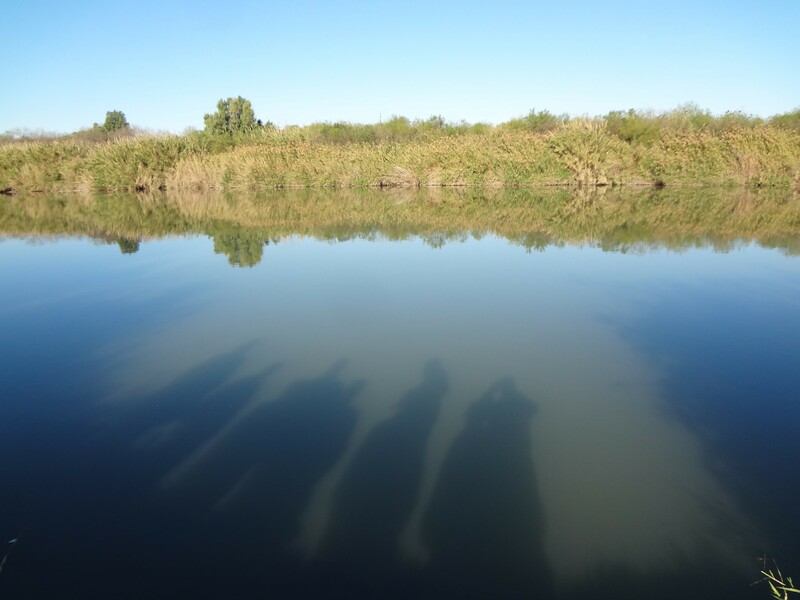 This photo is taken at the banks of the Rio Grande, and the experience of the “encuentro” inspired the following poems by two Wartburg students. Than what you have lived so far. But it is a risk to cross. To make it to the other side? Loss, hope, despair, another chance. Where life and death are only inches apart. Who will meet you in the beyond if you manage to cross? You have heard the stories. But that’s the first thing they take away over there. But you have people who depend on you. She’s going to make it. They don’t understand how she’s already lived on the borders her whole life. Life can be found in both places. And other ways of surviving. It is worth it, for the sake of her family. It is worth it, for the sake of her soul. Which belongs to no one but God. And gives thanks to God. And is intercepted by border patrol. Her soul is not bound. She knows to her very core that God is faithful. Yo estoy segura que Dios me va a liberar. And who has the power to draw them. Can be justified and erased in the history books in one generation. The travel of money from place to place. But sold for cheap in the definition of “us”. A dream stuffed into our souls to muffle the terror growing in our hearts. The land cries out, and the rivers swell, enraged at the injustice. Of the “American Dream,” feel the pain. Sleepless, unable to awaken and see ourselves downstream, face to face. And we didn’t cross the border, the border crossed us. It is the Spirit speaking plainly about the Kingdom. What will be given to them? We came here to look at a river. And all we see are shadows. But why am I struck blind at the sight? A shaded shape glimpsed in outline in front of a bright light. What does your reflection look like, Narcissus? You ever thought you could be again. This is still no Promised Land. It is an escape from violence through violence into violence. But in which dream is the Spirit growing? A threshold of epiphanies, a thin place in between places. And what are they dreaming about here, in the Borderlands? The seeds of another Kingdom? Baptized into something else entirely. And they are hungry and trying to catch some fish. As a point of communion. The dream of a New Creation. The Spirit is flourishing on the food of this Tierra.